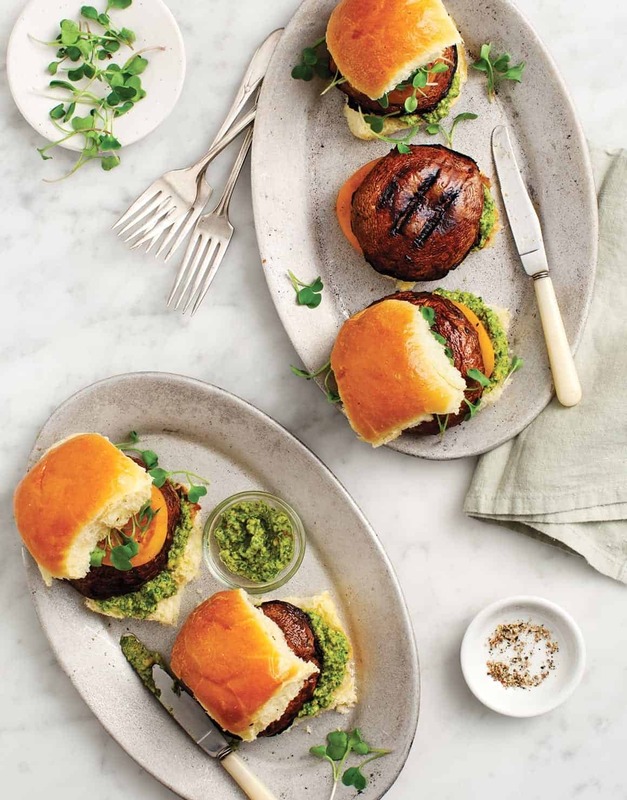 Here's a round-up of the best vegan & vegetarian grilling recipes, plus a recipe for balsamic-marinated portobello sliders with bright pepita pesto! When I first became vegetarian, grilling holidays were the hardest. Back then, packaged veggie burgers tasted like cardboard and the only solution I had was: please, please pass the ketchup… and the pickles, and the mustard, and anything and everything else that could make my “meal” taste edible. Every good BBQ needs a potato salad, but that doesn’t mean that our potatoes have to be full of mayonnaise. 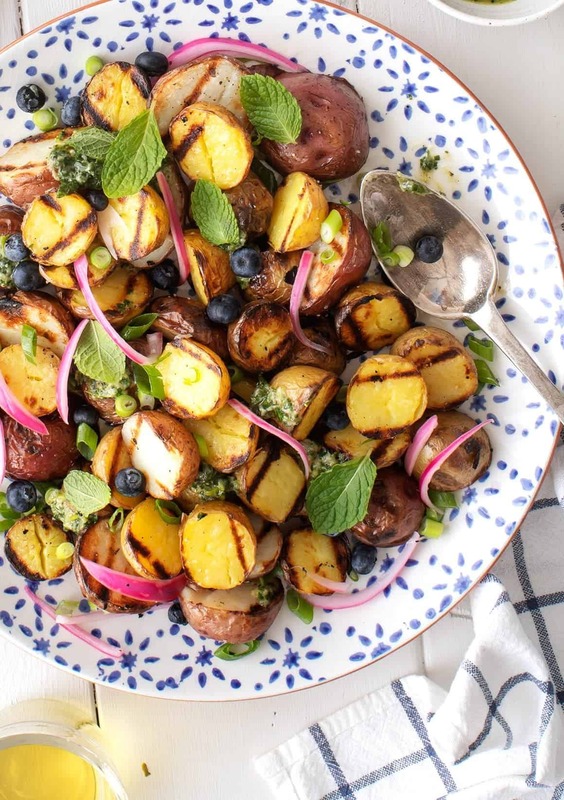 Try this grilled potato salad with grilled scallion vinaigrette and grilled blueberries. You’ll want to make it for your friends all summer long. I posted this one a few weeks ago and so many of you have loved it! This was my first time grilling avocados. At first, I wasn’t sure if I’d love cooked avocado, but the char really brings out the creaminess of the avocado and the cool, tangy filling balances it perfectly. I’m sure you’ve noticed by now that Jack and I love mushrooms. I think mushrooms sometimes get a bad rep because they’re often not prepared well. These mushrooms also get coated in the go-to marinade that I mentioned above. The strips then get stuffed into tortillas with creamy (vegan) cashew jalapeño sauce. This is by far one of my favorite ways to eat mushrooms. Asparagus is at peak season right now, so head to your farmers market and grab some! 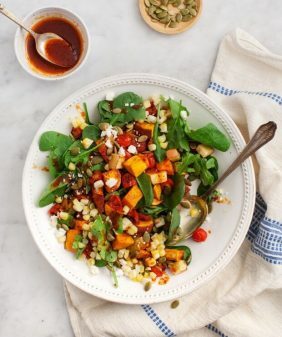 Make this salad as a side dish for your gathering and save the leftovers for lunch! 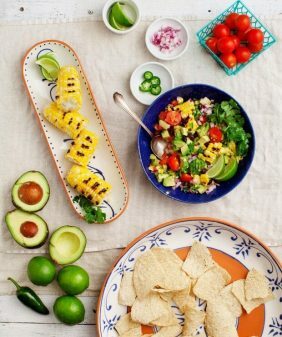 I love corn so many ways and this is one of the simplest. 1. 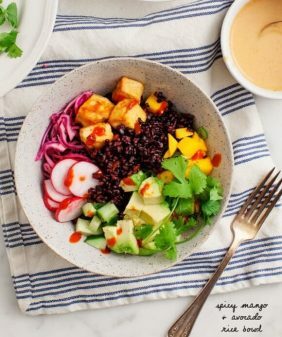 Make a quick sauce with avocado oil mayo, cilantro, lime, serrano pepper, and other seasonings. 2. Slather on grilled corn. (Use vegan mayo if you’re vegan). If you love corn, but don’t love eating it straight off the cob, this taco recipe is for you. Grilled corn, grilled green beans, and grilled tomatillo salsa are stuffed into (you guessed it!) grilled tortillas. We might never cook on the actual indoor stove again. This is a quick cheater’s version of ratatouille but the flavors are all still here thanks to a pop of vinegar and a shake of herbes de Provence. A fun spin on tomato toast. If you have picky eaters or you don’t know what to make for guests, make mix and match quesadillas! Everyone can assemble their own, grill, and eat. 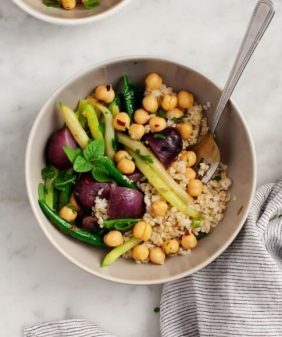 Cookouts aside, if you need a delicious, simple, summer dinner tonight – make this! 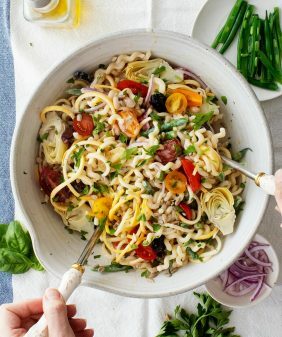 This meal is a regular for me – grilled zucchini and eggplant are tossed with soft feta cheese and a lemony, herby orzo with a few breadcrumbs for crunch. I’m drooling just thinking about this one! 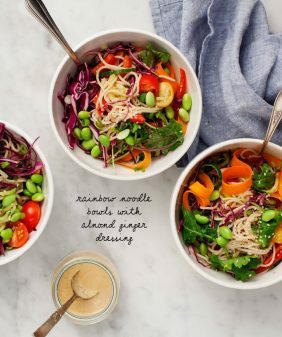 Recipe from the Love & Lemons Cookbook! Great for summer cookouts, these yummy sliders are vegan & gluten-free with gluten-free buns. Make the pesto by combining the pepitas, garlic, cilantro, lemon juice, cumin, salt, honey (or maple) in a food processor. Pulse until combined. Drizzle in the olive oil and pulse until smooth. For a smoother pesto, you could add more olive oil, but I prefer a thicker consistency for these sliders. Heat a grill or grill pan over medium heat. Prepare the mushrooms by removing the stems and cleaning the caps with a damp cloth or paper towel. Place the mushrooms in a rimmed plate and drizzle with olive oil, balsamic vinegar, tamari, and pepper. Use your hands to help coat the mushrooms on both sides. Place the mushrooms, gill side down onto the grill pan. Cook about 10 minutes per side, or until mushrooms are tender. Place the mushrooms on the toasted buns and top each with a tomato slice, microgreens, and a generous slather of Pepita Pesto. I’m so glad it was a hit!